Here's a simple, fun and delicious recipe that you're going to want to add to your recipe lineup this summer...but they're delicious any time of the year! We've made these watermelon cupcakes twice now and they're on the menu for a birthday in a couple weeks...in other words, they've been a big hit! When little DIY (my 10-year old daughter) requested Watermelon Cake, I did a little searching online and found this recipe that I adapted for cupcakes. 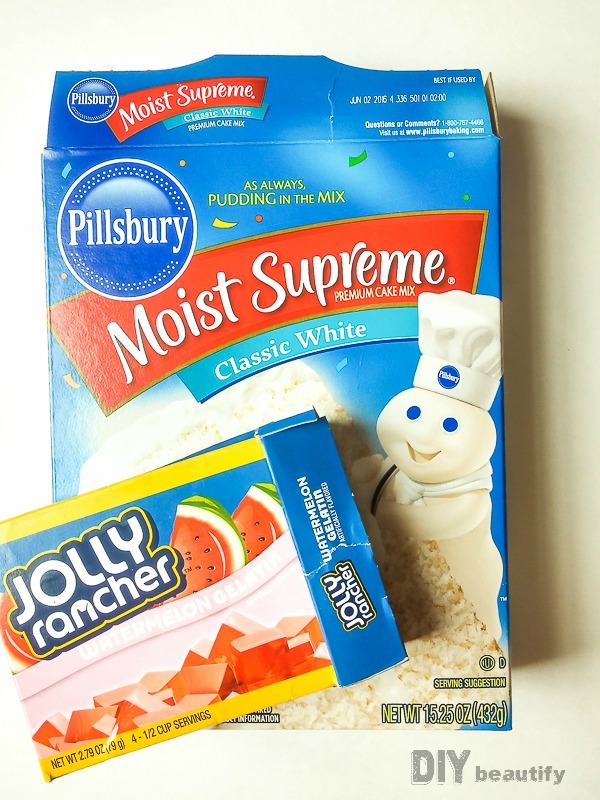 The recipe uses a white cake mix* and a package of watermelon jello mix*. I used Jolly Rancher Watermelon Jello mix, which made the cake kind of tangy and tart...a great contrast with the dark chocolate chips. 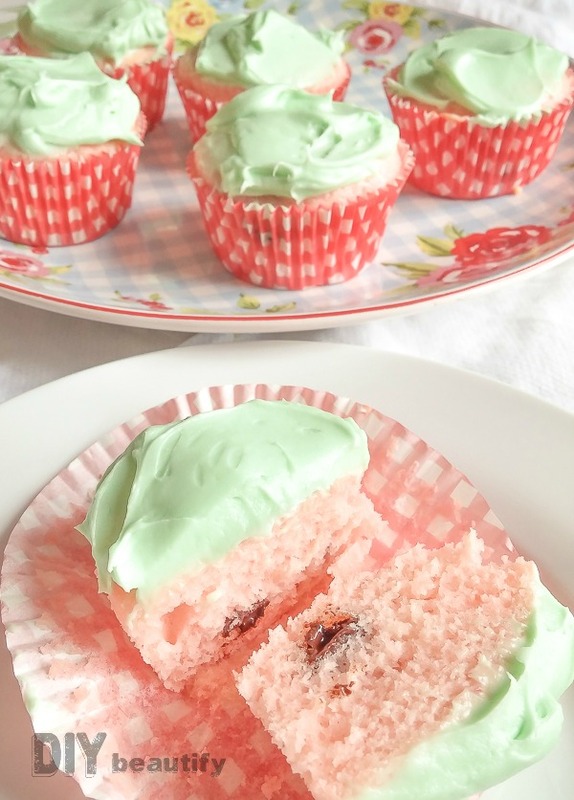 At the time, I only had regular sized chips in my pantry; since then I've made these Watermelon Cupcakes with mini chocolate chips (both in the batter and on top of the icing). The chips resemble watermelon seeds and look so cute! I made my own Cream Cheese Frosting and colored it very pale green to resemble the watermelon rind. 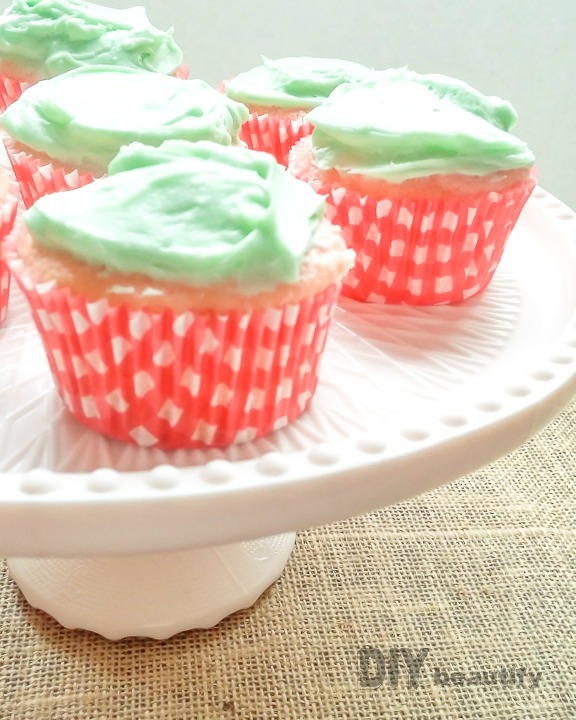 Do yourself a favor and make your own cream cheese frosting! It's only a couple ingredients (including butter of course), but the taste is far superior to the packaged frosting and really sets your cupcakes apart and adds to the homemade-over-store-bought-taste! Baked in red gingham cupcake wrappers*, not only are these cupcakes adorable, they're really good! 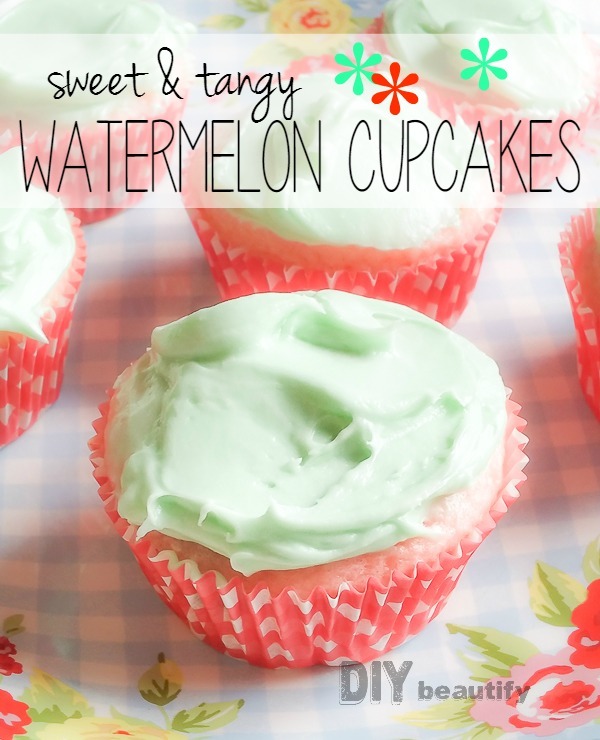 They're moist and not overly sweet; they have the tangy-ness from the cream cheese frosting and the tartness from the watermelon flavoring. If fact, although we're not 'cake people' at our home, we all gave these a thumbs up! There's something about the colors of these cupcakes that just says 'summer'! What's your opinion...too strange...or do you think they look good enough to eat? What's your favorite cupcake? Let me know in the comments section! Seems like a great watermelon cupcake... never would have thought of such a flavour...they look lovely, tangy and tarty, lovely combination. Thank you, yes they are a little unusual but very tasty! Wonderful recipe.Thank you so much for sharing this recipe.